Excellent location, great price, friendly staff. Room service did not replenish the shampoo. Terrific location, clean and efficient rooms, excellent free wireless. I loved being able to print my boarding pass from the free computer! Clean hotel close to everything we needed, within walking distance. First day check in, they did not have a room with two beds, but did have two bends on the way back. When you stay at the Comfort Inn Gaslamp/Convention Center, San Diego, California, you'll be close to everything in San Diego such as restaurants, night clubs, galleries, theaters and places to shop. Visit Seaport Village which has shops, restaurants and entertainment. Take the San Diego Trolley to the San Diego Zoo, Balboa Park & Museums, Old Town, the beach and Tijuana, Mexico. Your family will enjoy Sea World Adventure which is only 10 minutes away. Another place to visit is Belmont Park which is a beachfront amusement center. Balboa Park: Aerospace San Diego has many exhibits and artifacts. If you like horse racing, go to Del Mar Race Track. Many golf courses are in San Diego if you enjoy golfing. There are trails in the parks around the city for horse riding, biking and hiking. Ask the friendly staff if you have any questions or need more information about places to shop, restaurants or things to do. The Comfort Inn in Gaslamp, San Diego, California has 103 guest rooms where youll find amenities such as coffee makers, hair dryers, irons and ironing boards. Sit back and watch a good movie on cable or pay per view television. Choose from different size beds in non-smoking rooms. 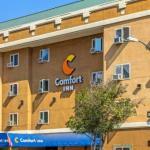 The Comfort Inn in Gaslamp, San Diego is a perfect choice for pleasure or business travelers. Begin your day with a tasty complimentary breakfast with many food choices. Enjoy a swim in the pool or get a pass to the body works fitness center. This hotel has the convenience of guest laundry services including dry cleaning so you can keep your clothes clean. Business travelers can benefit from the two flexible meeting rooms, business center, copier and fax. Theres also internet access. There's a free shuttle from the San Diego Airport only. Yes, I would recommend the Comfort Inn in Gaslamp, San Diego California to my family and friends. This is a very clean and comfortable hotel. The staff is friendly and makes you feel welcome. The complimentary breakfast is good and has a varied selection of hot and cold food. The guest rooms and the bathrooms are very nice. There are plenty of amenities provided including safes to keep your valuables. You can see a view of the bay area when you stay at this hotel. It's in a good location close to bars, restaurants and shops. It's also only a short distance from the beach and the zoo.